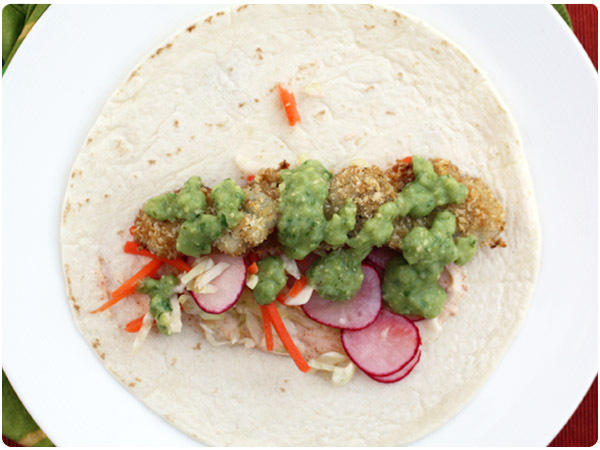 Yesterday for Cinco de Mayo I was lucky to have some fresh fish to work with for these tasty, tangy baked fish tacos. Fish tacos are a regular in our repertoire but lately we’ve been baking them instead of frying them. With a substantial panko crust, they taste just as good with a bit less guilt. I used fresh pan fish but tilapia or any readily available white fish would be delicious. Shrimp would also be a great choice. 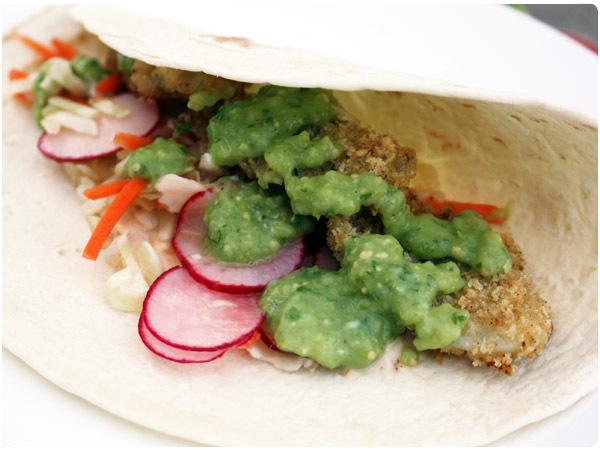 I served the fish tacos with a homemade creamy tomatillo salsa, with the bright flavors lending themselves well to seafood. I like to add avocado to my version since the richness of the avocado helps balance out the tang of the tomatillos. Add in some sweet carrots, crunchy cabbage and peppery radishes and you have the perfect spring meal. Preheat oven to 350. Grease a cooking sheet or glass pan and set aside. In a medium bowl or large Ziploc bag, combine panko, parmesan and spices. Stir or shake to combine. Melt butter in a small bowl. Dip fish filets lightly in butter, then toss in breading mixture to coat. Set on cooking sheet. Bake for 20-25 minutes depending on thickness of filets. Fish should be white and flaky when fully cooked. In a medium bowl, add cabbage, carrots and radishes. Drizzle on olive oil and lime juice, tossing to combine. Season with salt and toss again. Serve baked fish with warm tortillas, chipotle mayo, tomatillo salsa and hot sauce. 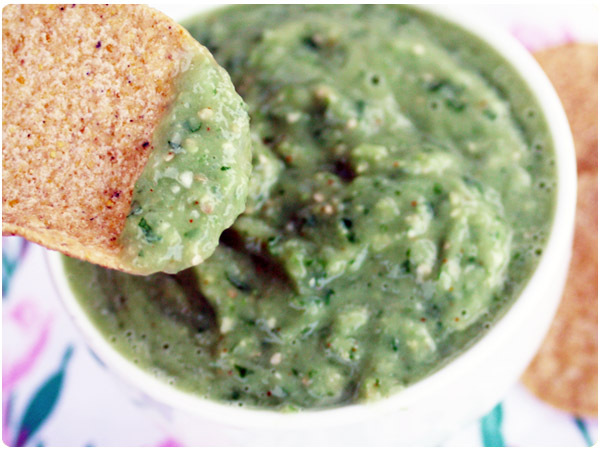 Add tomatillos, avocado, onion, jalapeno, garlic, cilantro and lime juice to a food processor. Process until blended and just barely chunky. Add salt and cayenne and pulse two more times. Add additional salt or cayenne to taste if desired. Yum, yum, Fresh fish tacos!